Martin O'Neill accused Newcastle United striker Dwight Gayle of diving after a dramatic night at The Hawthorns. West Bromwich Albion, Gayle's loan club, came from behind to draw 2-2 with Nottingham Forest last night. Gayle went down easily under pressure from Alexander Milosevic and Yohan Benalouane to earn a penalty and allow Jay Rodriguez to equalise two minutes from time. Newcastle winger Jacob Murphy, also on loan at West Brom, had scored the Championship club's first goal. O'Neill, Forest's manager, refused to criticise referee Lee Mason after the game, though he was unhappy with Gayle's actions. "I spoke to the referee," said O'Neill. "He said it if it was a mistake, it was an honest one, and I accept that. "It certainly looked like a dive. I've seen it back twice from a rather long lens angle, and not on TV, but everyone I have spoken to says it was a dive. "In this day and age, it's very difficult for a referee – harder than it's ever been. "It would have been great to have won the game, away from home against a side looking for automatic promotion." West Brom head coach Darren Moore had a different view of the penalty incident. "In real time, it looked a penalty," said Moore. "Once I look back at it, I'll be able to give my opinion on it. It's earned us a point. 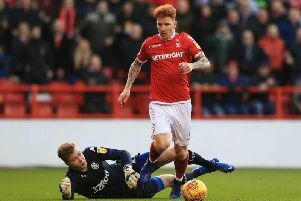 Stefan Johansen's own goal and Ryan Yates' second-half strike had twice put Forest ahead either side of Murphy's goal at The Hawthorns. Gayle has scored 16 goals for West Brom, who are fourth in the league. Meanwhile, rival fans shared a video clip of Gayle diving into a swimming pool which was posted on Twitter by his club last month. The tweet read: "Professional footballer and Olympic diver."